-Time is divided into frames and frames into time slots. -Data is transmitted as packets every packet in one time slot. -Based on the first come-first served. -Remote sites sends the packets randomly at any time slot and wait for acknoledge. -If no acknoledge came (a collision happen),they wait random time and retry to send the packet again. -CSC(Comman signalling channel):-which communicates with the CSC-PDC at the hub on the IB and OB channels.And also controls and takes request from the voice and data cards. -Four voice and data cards. -Transmitt at rate 9.6-2,048 Kbps. 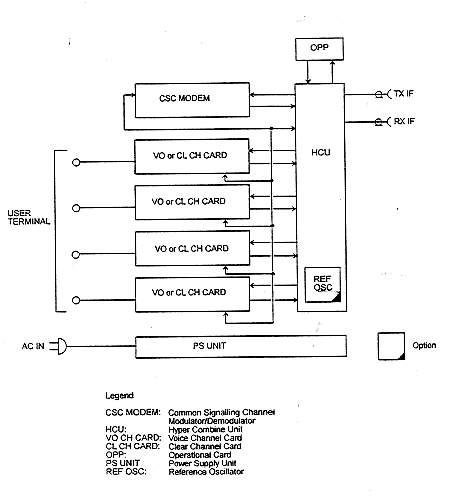 -�Contain a modem and BBP(Base band processor. -Support analog data interface(can be connected to your PABX or telephone). -Since max freqquncy of voice is 4KHZ so it make sampling at rate 8KHZ or more.With 256 level of sound(8 bit each sample).So it transmit voice at rate 64Kbps and then make a data comprision for it to be with less rate. -Support asynchronous data interface along RS-232. -Comtains a modem and BBP. -Five voice and data cards. -Dose not have CSC sine it is completly controlled by the main IDU.